Accordingly Chhattisgarh State Power Distribution Company Limited (CSPDCL) came into existence w.e.f. 01.01.2009. CSPDCL provides electricity to consumers across the Chhattisgarh State. Chhattisgarh State Power Distribution Company Limited has been registered by the ‘Registrar of Companies MP & CG’ with Registration No. U40108 CT 2003 PLC 15822. 33/11 kV Sub Stations 1213 Nos. 11/04 kV Substations 1,56,094 Nos. Agriculture Pump Consumers 4,13,904 Nos. in State Electricity Board in year 2006. • CSPDCL has established a State of Art Centralized Data Center at its head office, Raipur. Chhattisgarh State Power Companies spread over Chhattisgarh State. 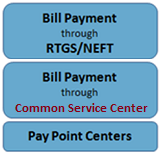 services to the consumers of entire CG State.